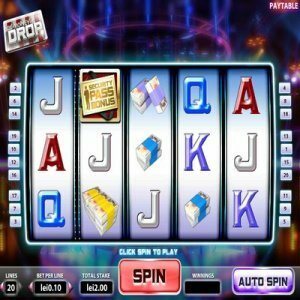 [miau] The Money Drop Slot machine is a 5 reel, UFO based theme that is sure to please those who like to bet and win big. The game comes with 20 pay-lines with over 1000 coins available per spin. The game is very progressive and has a plethora of bonus features. Players have the option to grab multiple cash rewards. The highest possible reward for cash rewards is close to $125,000. The coin range averages between .01 and 1000. Players can pick from a set of various languages. It is very easy to find the information section. There is also an option to play the game in the browser, which means players will not need to download a software in order to play. If a player is lucky enough to land the Security Pass Bonus symbol, they will accumulate multipliers and free spins. It all boils down to luck and if the player has a natural betting streak. It is a very straightforward betting machine that will keep any player entertained for a number of days. The game comes with three rows of symbols that show up on the screen. There is no progressive jackpot, but comes with a pretty good bet per line. Betters can calculate their earnings by multiplying their bet per line by the combination index. The maximum multiplier than can be given is x2500. The icons that are showed on the computer screen are similar to that of the TV show connected with the game. Viewers will get an eye-full of visuals including, bundles of money, colorful strips, letters and playing cards. One of the most important symbols include the Money Drop Bonus and the Security Pass Bonus. The Wild symbol will be featured in gold and show on the third reel. When the reel is stopped, four random symbols will turn into silver wilds. When this happens, it will turn into a winning combination. The Money Drop Bonus will often trigger the bonus round. There are a total of two bonus rounds available in the Money Drop Slot Machine. They include the; Money Drop and Security Pass. In the Money Drop bonus round, the players have the opportunity to take part of the actual television show. Players are encouraged to save as much money as possible. In the Security Pass bonus round, you will need to click on the dropped packs of money in order to see the amount of free spins that are available. The casino will then set a current bet and free spins can be prolonged.